Firehole Ranch is located just outside Yellowstone National Park on 640 private acres along Hebgen Lake. As the 2013 Orvis Endorsed Fly Fishing Lodge of the Year and a Forbes Top 10 Fly Fishing Lodges in the World, we pride ourselves on the experience we provide to our guests. 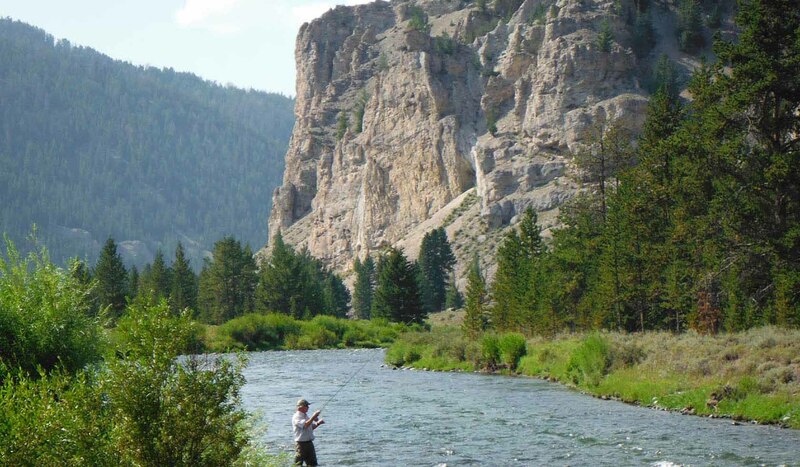 Our spectacular location affords easy access to an unmatched variety of blue ribbon trout waters, like the Madison, Yellowstone, Henry's Fork of the Snake, Gallatin, all of the fishable waters in Yellowstone National Park and more. In addition to the spectacular fishing, our proximity to the Park and thousands of acres of bordering forest service land offers unlimited recreational opportunities. Guests can enjoy canoeing or kayaking on Hebgen Lake, mountain biking and hiking as well as half day or full day horseback rides, including riding to Coffin Lake for high alpine lake fishing. As a member of the National Registry of Historic Places, we honor our historic roots first as a working ranch established in the 1890's that supplied a majority of beef to the troops and visitors in Yellowstone National Park and second as a guest ranch started in 1947. The lodge and cabins were handcrafted of lodge pole pine from the surrounding forest and over the years, the Ranch has been maintained to preserve its original style and elegance. Our Master Chefs Bruno and Kris Georgeton have honed the Firehole Ranch culinary experience from their 23 years at the Ranch. Our Gourmet Western cuisine combines Bruno's skills from his years growing up and working in France with the western style of food known in Montana. After your day of fishing, horseback riding or maybe just relaxing, you'll enjoy conversation over cocktails with other guests and staff sharing stories of how the day was spent. Dinner is served in the Lodge, where you can expect such offerings as fresh Alaskan Halibut and seared Elk Chop, complemented by a carefully selected wine and exquisite dessert.